EZSync USB Isolator protects PC or Laptop while connecting USB peripherals which is wired to high voltage. This small, industrial-grade isolator is very easy to use and provides a high-voltage barrier protection against surges, noise and ground loop errors. It is suitable for use in sensitive applications like automotive measurements. 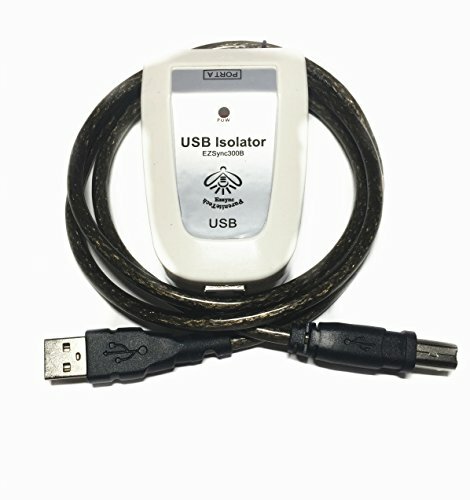 USB isolator provides a high - voltage isolation barrier between computer and it's connected USB device. The isolation protects equipment from electrical over-voltages and transient voltage spikes, by eliminating ground loop currents flowing between the PC and USB device which can cause damage and inaccurate measurements. Additionally, isolation minimizes conducted noise from static discharge, magnetic fields and radio frequency interference. USB isolator is USB bus powered and can provide 5V 400mA to your USB device with built-in isolated DC-DC converter. The compact and portable solution provides a high-voltage barrier to upstream USB I/O equipments, testing instruments, medical devices to protect against ESD, surges, EMI/RF noise and ground loop errors. Isolated power is provided through an integrated DC-to-DC converter. 1500V Isolation, 400mA maximum current capability. Ideal for eliminating audio equipment ground loop noise. Insert it into USB input of any computer, audio DAC, USB mixer, receiver, streamer, car, or smartphone can eliminate or significantly minimizes jitters and packet errors. Dimensions: 50mm(2in)*76mm(3in)*25mm(1in) isolator with USB cable included. PLEASE CONTACT US BEFORE BUYING SO WE CAN CHECK IF IT WILL WORK WITH YOUR DEVICE! Please read datasheet in the "Technical Specification" section of this page.